1956 USSR Soviet Russia FLOWER DESIGN Illustrated Manual Album Book RARE. 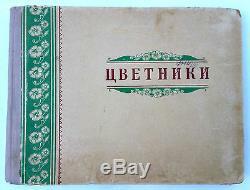 Size 17.5 x 22.5 cm, 288 Pages, Weight 572 g, Moscow Edition, Circulation 35 000. The item "1956 USSR Soviet Russia FLOWER DESIGN Illustrated Manual Album Book RARE" is in sale since Saturday, May 21, 2016. This item is in the category "Antiques\Architectural & Garden\Garden". The seller is "pet_rusha777" and is located in Tallinn, Estonia. This item can be shipped worldwide.